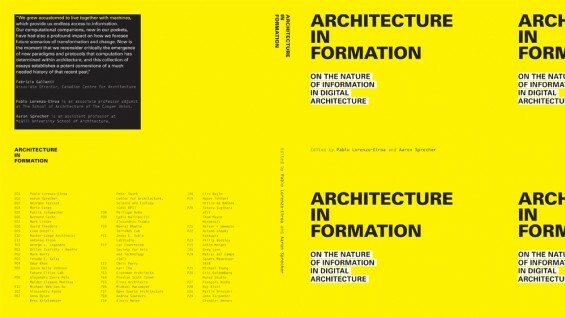 Architecture in Formation is the first digital architecture manual that bridges multiple relationships between theory and practice, proposing a vital resource to structure the upcoming second digital revolution. Sixteen essays from practitioners, historians and theorists look at how information processing informs and is informed by architecture. Twenty-nine experimental projects propose radical means to inform the new upcoming digital architecture. - Fabrizio Gallanti, Associate Director, Canadian Centre for Architecture. Featuring essays by: Pablo Lorenzo-Eiroa, Aaron Sprecher, Georges Teyssot, Mario Carpo, Patrik Schumacher, Bernard Cache, Mark Linder, David Theodore, Evan Douglis (AR '83), Ingeborg Rocker and Christian Lange, Antoine Picon, Michael Wen-Sen Su (AR '02), Chris Perry, Alexis Meier, Achim Menges and Martin Bressani. Projects by: Diller Scofidio + Renfro (Elizabeth Diller, AR '79; Diller Scofidio, AR '55); Mark Burry; Yehuda Kalay; Omar Khan; Jason Kelly Johnson, Future Cities Lab; Alejandro Zaera-Polo and Maider Llaguno Munitxa; Anna Dyson / Bess Krietemeyer, Peter Stark, Center for Architecture, Science and Ecology (CASE); Philippe Rahm; Lydia Kallipoliti and Alexandros Tsamis; Neeraj Bhatia, Infranet Lab; Jenny Sabin, Lab Studio; Luc Courschene, Society for Arts and Technology (SAT); Eisenman Architects; Preston Scott Cohen; Eiroa Architects; Michael Hansmeyer; Open Source Architecture; Andrew Saunders; Nader Tehrani, Office dA; Satoru Sugihara, ATLV and Thom Mayne, Morphosis; Reiser + Umemoto (Jessie Reiser, AR '81; Nanako Umemoto, AR '83); Roland Snooks, Kokkugia; Philip Beesley; Matias del Campo and Sandra Manninger SPAN; Michael Young; Eric Goldemberg, Monad Studio; Francois Roche; Ruy Klein; Chandler Ahrens and John Carpenter. Pablo Lorenzo-Eiroa is an associate professor adjunct at The School of Architecture of The Cooper Union and director of the Digital Representation and Fabrication Program. He is the design principal of Eiroa Architects. Aaron Sprecher is an assistant professor and research director of LIPHE at McGill University School of Architecture. He is co-founder of Open Source Architecture (O-S-A) and member of the Editorial Board of the Journal of Architectural Education.